to join us for some delicious healing teas,soups and free community style acupuncture. We will learn more about how acupuncture can help boost your immune system. Be ready Cold & Flu season is just around the corner. AOM DAY is a community event This event will be Held in our private wellness center. All participants will receive a gift bag valued at $40* containing wellness product samples, and discount service coupons. 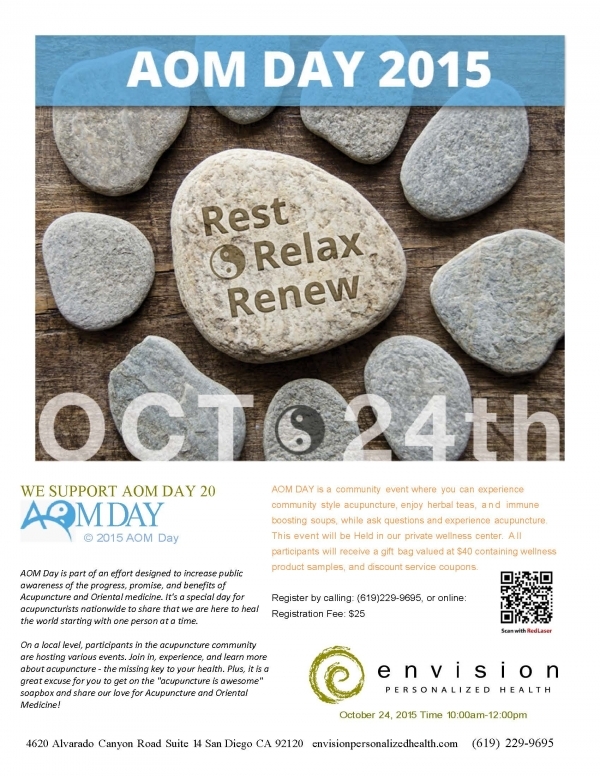 AOM Day is part of an effort designed to increase public awareness of the progress, promise, and benefits of Acupuncture and Oriental medicine. It's a special day for acupuncturists nationwide to share that we are here to heal the world starting with one person at a time. On a local level, participants in the acupuncture community are hosting various events. Join in, experience, and learn more about acupuncture - the missing key to your health. Plus, it is a great excuse for you to get on the "acupuncture is awesome" soapbox and share our love for Acupuncture and Oriental Medicine! Acupuncture can also treat pain, men & women's health issues, insomina , stress, depression, digestive issues, and help to eliminate cravings.